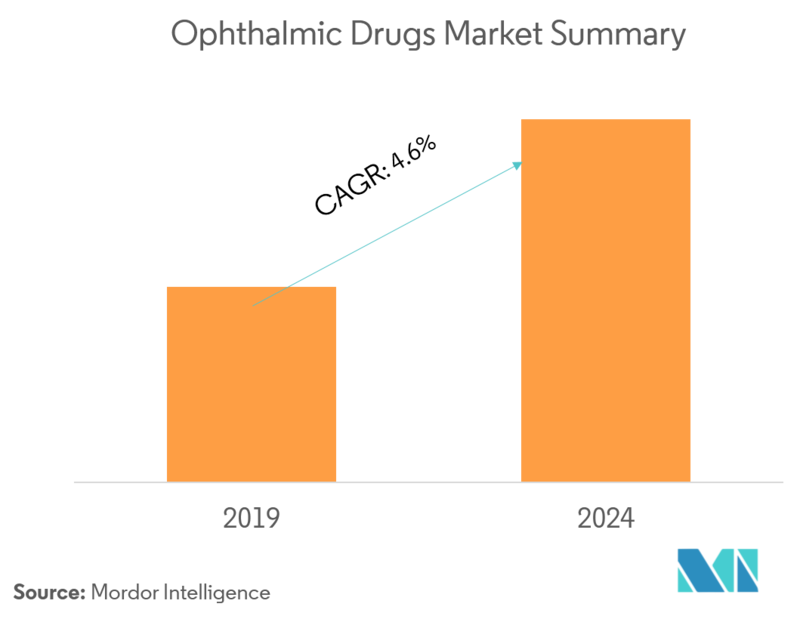 The major factors attributed to the growth of the ophthalmic drugs market include the increasing incidence and prevalence of eye-related disorders, rising R&D activities pertaining to the development of novel drugs, and increasing focus on developing combination therapies. The increasing prevalence of eye diseases is increasing the demand for ophthalmic drugs, globally. In many developed and developing countries, eye conditions have emerged as potential threats to the status of sight of their populations. The increase in the prevalence of diabetes in various countries has caused diabetic retinopathy to be added to the priority list. Glaucoma, an eye disease known for centuries, remains on the public health agenda due to difficulties in its early diagnosis and frequent necessity of life-long treatment. According to the WHO, in 2018, it was estimated that approximately 1.3 billion people were living with some form of vision impairment, 188.5 million people had mild vision impairment, 217 million had moderate to severe vision impairment, and 36 million people are blind. Globally, the leading causes of vision impairment are uncorrected refractive errors and cataracts, and the majority of people with vision impairment are over the age of 50 years. According to the WHO, chronic eye diseases are the number one cause of vision loss, with the top two causes being unoperated cataracts and uncorrected refractive errors. The former is the leading cause in countries with low- or middle-incomes. More than 80% of the vision impairments are curable or preventable, which means that these drugs are required for the management of the diseases. Hence, the rising incidence of eye-related disorders is projecting a great impact on the growth of market studied. As per the scope of the report, ophthalmic drugs are the drugs used for treating glaucoma, cataracts, diabetic retinopathy, and other ophthalmic disorders. 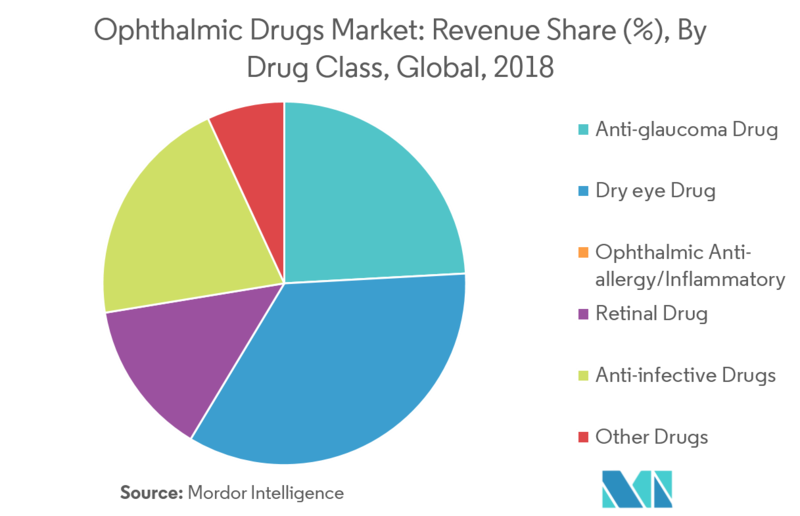 An increasing prevalence of eye disorders and increasing R&D on the development of novel drugs are the major factors driving growth in the global ophthalmic drugs market. 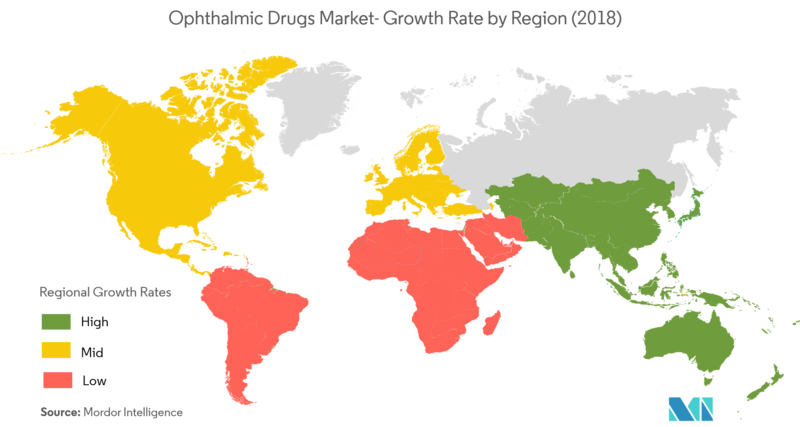 The market is segmented by drug class, product type, and geography. Dry eye disease (DED) is a multi-factorial disease of the tear film and ocular surface that results in ocular discomfort, visual disturbance, and tear film instability with potential damage to the ocular surface. It is a generally under-diagnosed clinical condition, as patients often attribute the experienced DED symptoms to aging, and hence, it remains an under-researched condition in the low- and middle-income countries. The prevalence of DED can be as high as 30% of the total population. 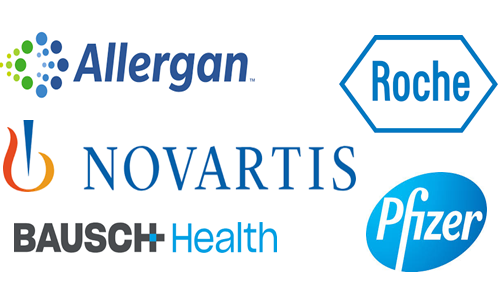 In the last decade, only one drug was approved for the treatment of DED by the US Food and Drug Administration (FDA) (i.e., Restasis by Allergan Inc.). DED is a major public health problem, the burden of which is likely to increase due to the increasing proportion of the aging population and the adoption of modern lifestyle. Dry eye disease is a common ocular disorder in the elderly and a frequent cause of eye care visits among this age group. The total annual cost of dry eye drug to the US economy can be more than USD 55 billion. Thus, the development of new drug treatments for dry eye is essential for both the dry eye patients and the ophthalmic industry. Many drugs are in the pipeline for dry eye diseases. The increasing prevalence of DED, approval of drugs for its treatment, and government initiatives to eradicate it are the main factors spurring the growth of the market studied. The ophthalmic drugs market is expanding and growing, globally. The market has been witnessing an especially exponential growth in the Asia-Pacific region. Glaucoma and tear substitute (for dry eye) drugs are the leading products in Asia-Pacific. India is likely to be among the top three pharmaceutical markets by incremental growth and the sixth-largest market, globally, in absolute size, according to the Clinical and Experimental Vision and Eye Research, India, 2018. Increase in the number of middle-class households, advancement in medical infrastructure, and the increasing penetration of health insurance in the country are likely to play a significant role in influencing this growth. According to the National Health Policy (NHP), in India, glaucoma is the leading cause of irreversible blindness with at least 12 million people having affected and nearly 1.2 million people having blinded from the disease. More than 90% of the cases of glaucoma remain undiagnosed in the country. Moreover, the prevalence of glaucoma increases with age. Thus, the rising prevalence of glaucoma and an increase in healthcare expenditure are spurring the growth of the ophthalmic drugs market in India. Furthermore, the country’s government is also playing an important role, since the cost of glaucoma treatment in India is one of the lowest in the world. The market studied is composed of a combination of both small and large firms. Most of the big companies are focusing on research and development to bring innovative products to the market. 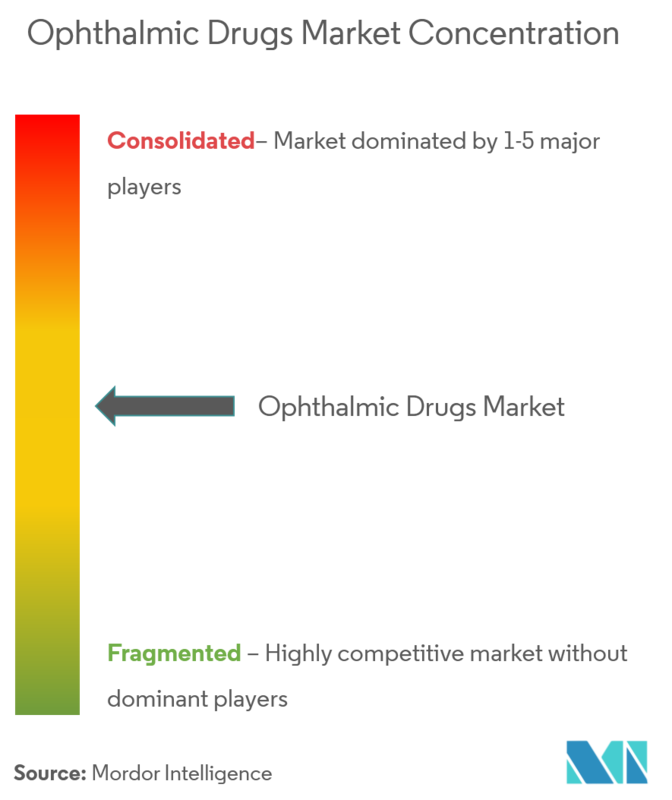 Some of the major players in the ophthalmic drugs market are Aerie Pharmaceuticals Inc., Allergan, Bausch Health, Bayer AG, F. Hoffmann-La Roche Ltd, Hoya Corporation, Novartis AG, Pfizer Inc., and Regeneron Pharmaceuticals Inc.
6.1.3 Bausch Health Companies Inc.